With the existence of Uber, the online taxi booking has grabbed everyone’s attention amongst the global business environment and the taxi hailing application development has become the latest and growing business development sector. Below are the factors which need to be considered while developing a taxi booking application. The taxi booking apps should own a rich and user-friendly interface that helps the customers clearly understand the functionality and supports easy navigation. Also, a centralized server system would help in keeping track of the website activities and have a control over for the effective performance of the taxi booking app. With a centralized server system, customers can easily keep track of the vehicle, its current location, check its availability and get real-time notifications. The tracking feature helps the drivers and passengers track each other’s location from their current spot, allowing drivers to find the passenger pickup point without much trouble. In the taxi industry, keeping track using geolocation is considered as really effective in online taxi booking app, where GPS facility is integrated with user-friendly Google Maps. As Google maps are essential in discovering the best feasible routes to its users, the taxi hailing applications are encouraged to employ this feature in order to spot the right source and destination of their drive. While booking a taxi, the users get appropriate notifications on the trip source and destination, and the distance traveled along with the payment details. The payment details are disclosed based on the source and destination point calculation with various payment options which allow users to drive cashless and make their payments through credit/debit cards. The implementation of push notification is an added advantage to the taxi booking application, where the app users are notified instantly on the current status of their rides. The push notifications include rides welcome note, source & destination, payment info, thank you note and much more. Developing a taxi booking app with the specified features is extremely time consuming. 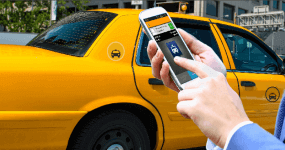 TaxiMobility, a prominent provider of taxi booking and dispatch software helps you in creating your own taxi booking application with several additional features based on your requirements within a very short time frame. ← Why do your delivery business need a dispatch software like uber ?